Charlotte’s softball team has pummeled district opponents thus far this season. 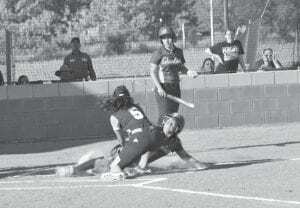 The Trojanettes moved to 10-0 in District 2A-30 play after beating Runge 15-0 in three innings at home on April 9. On April 5, Charlotte beat Falls City 12-0 on the road. Charlotte beat Pettus 15-0 at home on April 2. The Trojanettes scored four in the first inning, five in the second and six in the third. Jessalyn Sanchez drove in three runs. Stephanie Ramos had a hit and two RBIs. Annelise Gaitan drew two walks and struck out seven batters while allowing one hit in the threeinning game. The Trojanettes have scored at least nine runs in almost every district game. In its next to last district game, Charlotte will host Three Rivers as it looks to clinch the district title. Charlotte coach Chris Raimondi said this game will be much closer than March 19, when the the Trojanettes won 11-1. A loss, he said, would mean a tiebreaker game.